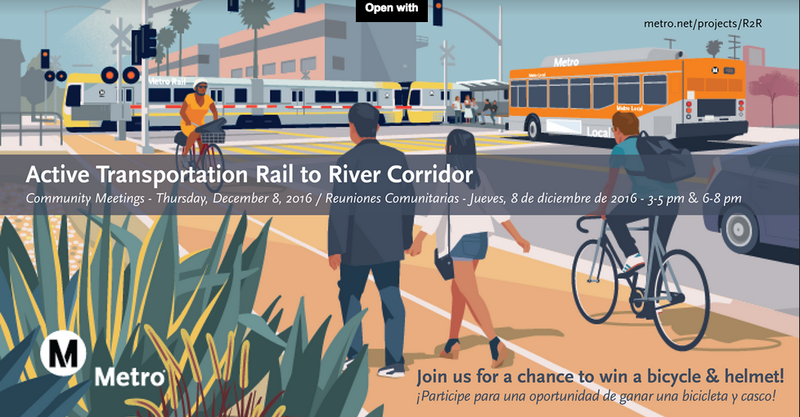 Next Thursday, December 8, Metro is hosting its second set of public forums on the Rail-to-River bike and pedestrian path planned for the Slauson corridor. One is scheduled for 3 to 5 p.m. and the other for an hour later, from 6 to 8 p.m.
For those unfamiliar with the project, the Rail-[to-Rail]-to-River active transportation corridor is a bike and pedestrian path planned for the now mostly abandoned rail right-of-way (ROW) running between the Crenshaw Line, the Blue Line, and, eventually, the L.A. River. At present, the 6.4-mile Rail-to-Rail segment straddling the two light rail lines is fully funded (in green, above) and scheduled to open in 2019. A community meeting to discuss the design of that segment will be held in the new year, somewhere in South Los Angeles. Because the December 8 meetings are meant to inform residents about the ranking of alternative routes for Segment B – the routes east of Santa Fe through the Southeast Cities – they will be held at the Bell Community Center (6250 Pine Avenue Bell, CA 90201). And a live webcast presentation will be made at 6 p.m., for those who cannot attend in person: www.tinyurl.com/MetroR2R. If the December forum is similar to a recent Community Advisory Committee (CAC) meeting for the project I participated in, attendees will hear about how the options for the southeast section of the ranked in terms of mobility and connectivity, access to major destinations, local community needs, cost effectiveness and ease of implementation, and impact on traffic, transit, trucks, and parking. They will also be able to consult route maps and offer feedback on the options presented. The Randolph ROW is quite wide, for the most part, and runs down the middle the street. While the tracks would not be removed in this segment of the project, there is enough space to create a path that would fully protect and separate users from vehicles traveling along Randolph. Union Pacific, who owns the ROW now, runs trains along it every now and then just so the tracks can be said to be “active.” But those occasions are so infrequent that locals have taken to parking on the ROW and using it as a jogging path. The option for an unprotected bike lane along Slauson, while appetizing for the potential traffic calming impact and direct connections to schools along that street, would not protect users the way the Randolph route allows for. And the Malabar and Utility Corridor routes, both in being shorter and moving north through industrial areas (and away from residential ones), would not have connected users to as many destinations or enhanced connectivity between the Southeast communities. Because nothing good ever comes for free, the Randolph route is far and above the most expensive. Metro estimates the route would cost as much as $16.7 million to construct and several million more to access the ROW. During the CAC meeting, the point was also raised that Metro may not have adequately factored in the costs of making the project one that catered to pedestrians (lighting, seating, etc.) or some of the community-centric features I’ve pushed for (fitness equipment, public art, etc.) meaning that the true project costs may be even higher than anticipated. The Randolph Street option drew no objections from the CAC participants. What several did want to know, however, was why there had been so little outreach regarding the project along Segment A in South Los Angeles. The December 8 Bell forum will mark the second public meeting on Segment B of the project (the first was in late August). Meanwhile, Metro has yet to hold a truly public forum on Segment A. The last meeting that was said to be public (but for which no outreach was done) was held in March of 2014, while the feasibility study was still underway. And a meeting that Metro said would be held some time during the fall was postponed until early next year, I was told, so that the design could be hammered out before it was shown to the community. As documented here over the past couple of years, I have chafed at how little effort was made to notify community members along the corridor. At the time, I was told (among other things) that the project was being kept on the down-low because Metro did not wish to get people’s hopes up. There was no money for the project, I was told, so it might be years before it ever came to fruition. I had objected to this approach then, arguing that if feasibility involved projections of who would use the space and how, knowing how residents currently used the space, their concerns, their aspirations for it, and insight into elements that would entice them to use it once it was implemented were probably as or more important as data on transit boardings at particular intersections. Obviously, when applying for a grant for an active transportation corridor (ATC), boardings and other quantitative measures demonstrating potential demand are important. But given that, in practice, the ultimate goal is to produce a project for actual human people in a disenfranchised community where the public space does not always feel so welcoming, building relationships with potential users and exploring how those people think about that space matters, too. Because, frankly, my guess is that most people are not going to use it to connect to transit. Sure, they are likely to use it to bike, skateboard, and walk to work or school or to the river. There is absolutely no doubt it will be useful that way. But the South and Southeast communities of Los Angeles are communities of multi-generational families and youth with few places they can go for recreation – meaning, residents are most likely going to use it to connect to each other. The vendors on Slauson near Avalon have been at that site nearly every weekend for almost a dozen years. 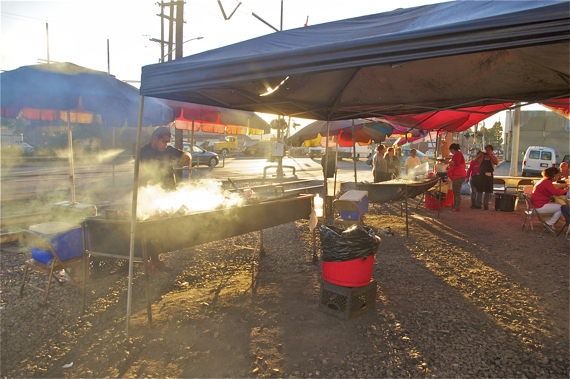 Many of the vendors along the corridor live in the area and draw loyal crowds from the community and beyond. Sahra Sulaiman/Streetsblog L.A. Frustrated with Metro’s reluctance to engage the community at the time, I had printed out meeting flyers myself ahead of the March, 2014, “public” forum, spoke with the vendors working along the corridor, and did as much door knocking as one unpaid non-Metro employee could reasonably do within a few days’ time. I found that people were genuinely interested in the project and excited to hear they might get such an amenity in their neighborhood. The vendors were interested too, both because they wanted to see some improvements along the corridor and because they were concerned about what it meant for their livelihoods. All had suggestions about who Metro could connect with to make the project more community-centric and how. But because no effort has been made to build a relationship with the communities along the South L.A. section of the corridor in the nearly three years since then, that knowledge and enthusiasm remains an untapped resource. And residents and commuters there are still largely unaware that the project even exists. Which is a shame, given what a great opportunity it represents to help repair some of the broken trust between the community and the city in the name of improving the area’s streets. That situation is unlikely to change going forward – with the grants Metro received last fall, the clock is now ticking on Segment A. They hope to have engineering and design for that segment wrapped up by June of 2017 so that the project can be completed by some time in 2019. Because of the issues surrounding the acquisition of the ROW along Randolph Street, it will likely be several years before ground is broken for Segment B. Meetings have not been set for Segment A as of yet. We will post that information when it is made available. Once again, the December 8 meetings will be held at 3 to 5 p.m. and 6 to 8 p.m. at the Bell Community Center (6250 Pine Avenue Bell, CA 90201). A live webcast presentation will be made at 6 p.m., for those who cannot attend in person: www.tinyurl.com/MetroR2R. But it is not clear if you can win the bicycle and helmet via webcast. In a year that has been mostly terrible from start to finish, it is nice to end on a positive note with happy drawings of how a blighted corridor might be transformed in a deserving neighborhood.